How cool are the “Boris” bikes? I didn’t know what a Boris bike was until it was explained to me that the public bicycles available around London are an initiative of Mayor of London, Boris Johnson. We had a great lunch at Hawksmoor Spitalfields after a disappointing morning when we couldn’t get into Olympic Park despite trudging all the way there, we decided to go for a cycle through London. 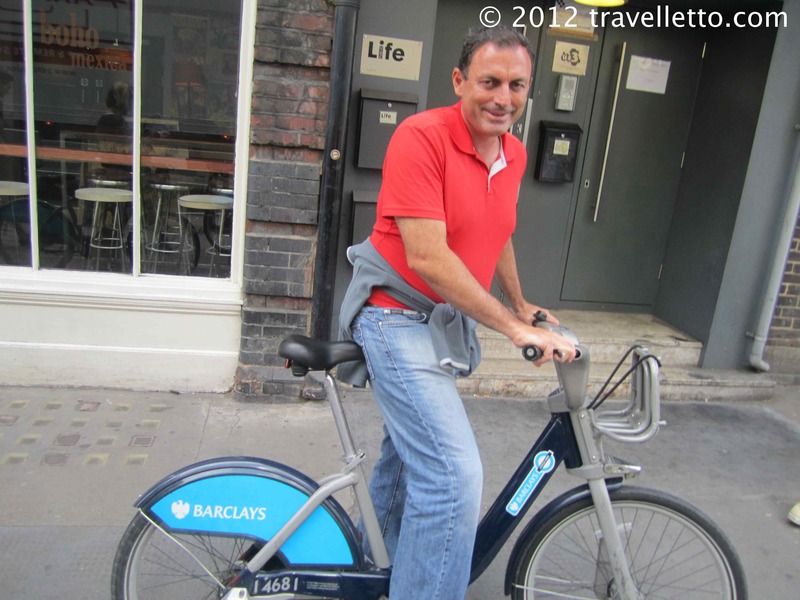 We rented the Boris Bikes properly known as the Barclays Cycle Hire. To access a bike, it costs 1 pound and access lasts 24 hours. If you dock a bike at a docking station within the hour, the cost of bike hire is free. If you ride for an hour, the cost is 1 pound; 90 minutes is 4 pounds; 2 hours is 6 pounds and so on. It was a beautiful sunny London day and the perfect day for a ride. We rode from Spitalfields down to the Thames, across the loveliest bridge in the world, Tower Bridge (so COOL! ), along South Bank, over London Bridge (which is really boring an just like any road bridge you see everywhere), along Embankment and finally stopping at St Paul’s Cathedral. It was so much fun! Mind you, Claire, Zorba and I had two pints each at lunch and were feeling pretty good to start with! We stopped a couple of times, at South Bank, and to give our tour leader, my lovely friend Claire, time to consult the map. After we ducked into St Paul’s for free (yay!) – it was just lucky timing as a service was due to start and the cashier’s taking the usual 12.50 pound entry fee had packed up for the day – we grabbed some water and re-hired our bikes. 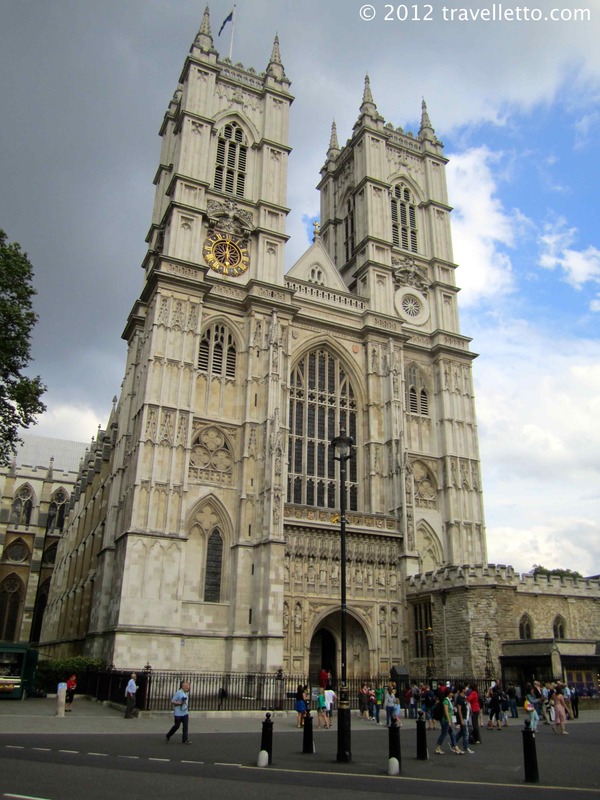 We pedalled across London, cycling along embankment to Big Ben, the Houses of Parliament, and Westminster Abbey. So so so cool! The best thing was that because the Olympics are on and the cycling event was on earlier in the day, many of the roads were closed and we were able to ride our Boris bikes along part of the Olympic cycle route. After taking in Westminster Abbey, we continued pedalling and headed towards Buckingham Palace. We rode down the beautiful tree lined Pall Mall that was closed to traffic – just magic! We encountered a few policemen along the way that were manning road blocks or just on general patrol and I have to say that every one of them was super friendly, happy to chat to us, giving us tips on where we can take the bikes and so forth. I was very impressed with the smiling friendly bobbies, even if some of them looked a bit scary carrying machine guns! 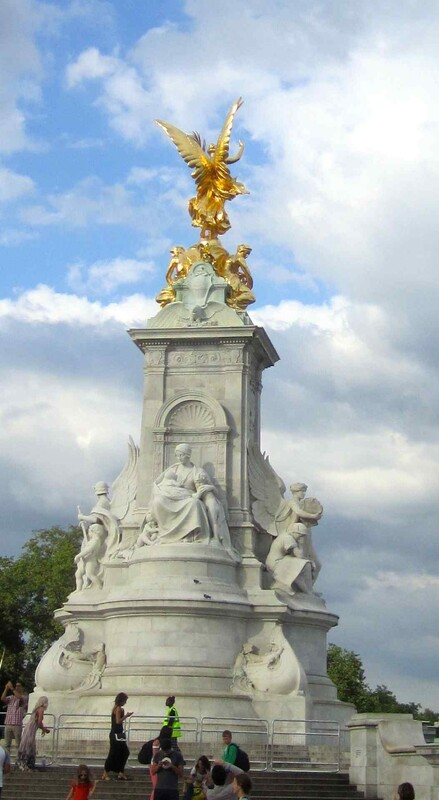 The Queen Victoria Memorial gold statue out the front of Buckingham Palace had obviously been polished by some mignon as it was looking very shiny. Zorba was underwhelmed with Buckingham Palace – he expected it to be grander, bigger, somehow. From Buckingham Palace, we rode through Green Park, Hyde Park corner, Marble Arch, and through Hyde Park to Kensington Palace. When we reached Queensway, we docked our bikes, regretfully. We all had such fun riding though London, taking in the sights at a leisurely pace, WITHOUT HELMETS. I loved that. If I didn’t have to wear a helmet I’d ride my bike in Perth much more I’m sure. London is an easy city to walk around – it’s not all that big or rather spread out really. But cycling adds another dimension. It was one of the most enjoyable days I’ve had in London. Pleasant weather, great friends, historical magical sites, access to the world’s famous monuments, closed roads and minimal traffic – really, we couldn’t ask for more. Moreover, the bikes are quite good quality. They are fairly heavy – not ideal for lugging up or down stairs (which we did once! ), but they have gears, are smooth to ride, have a handy little carry area on the front for handbags including a stretchy strap to hold bags in place, little flashing brake lights at the back, and they are so cheap! We walked up Queensway then along Westbourne Grove until we reach Kath’s place. We could have ridden the bikes almost all the way to Kath’s place as there’s a bike docking station about 60 metres from her house! Kath and Fiorenzo prepared a fab dinner of antipasti – buffalo mozzarella, mortadella, and home made focaccia which was sensational. We had really delicious authentic home made bolognese for dinner. Thanks guys! 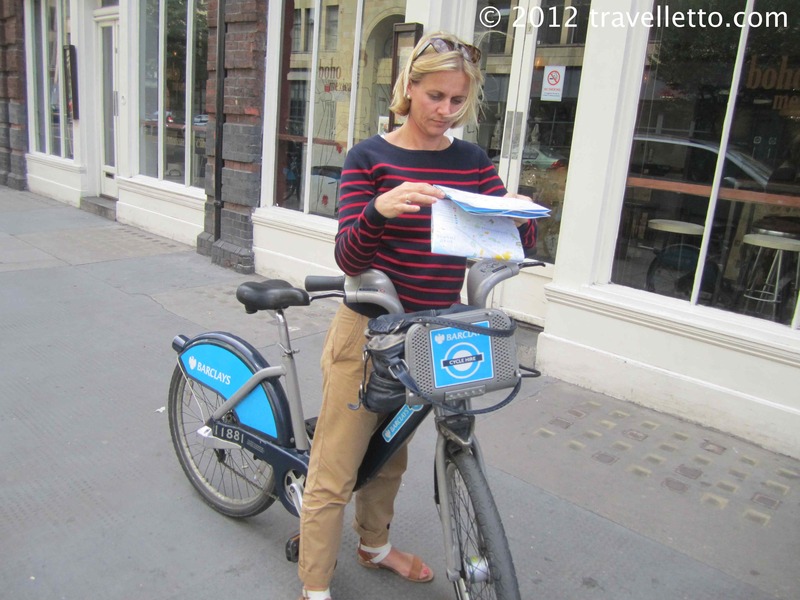 Hiring a Boris bike is a very highly recommended way to see London. Go on, get on yer bike! I’ve only heard bits and pieces about the Boris bikes controversy, for instance I know cabbies hate them! I wish we had them in Perth, such an easy, cheap and healthy way to get around, a great experience for tourists, although probably not so great for motorists. It’s easy to take things for granted when they are in your doorstep, we’ve all done it! Where are you in Australia? Hope you are having a fab time wherever you are! Ride safe around Sydney – I lived there for a couple of years and they are crazy drivers! Don’t skip Perth during your travels – it is a fab city and the best time to visit is summer. The beaches here really are some of the best in the world and much less crowded than Sydney’s. As for Adelaide…well I’ve heard there’s a good road out of there that heads west. Haha! Will follow your blog. Ciao!